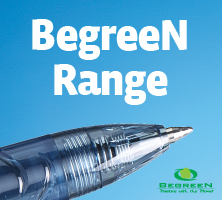 To receive a sample pack of products from the BegreeN range, we ask that you fill out the form at the bottom of this page. Only the first 300 that registers will receive the pack and you can only register once. 3 Responses to 300 Free Pilot Pens!